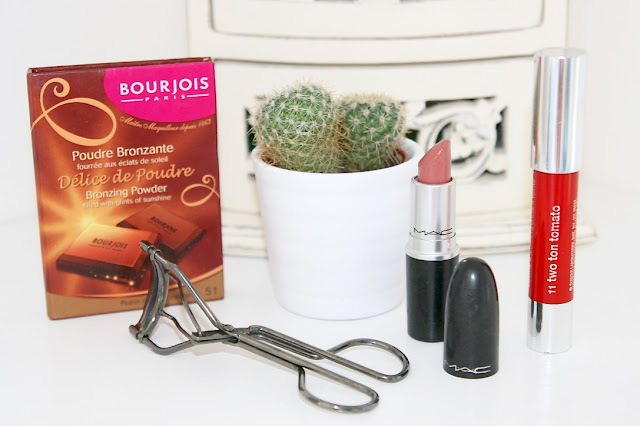 I need to apologise for being a bad blogger, I haven't done a monthly favourites since May! I usually do them right at the end of each month, but for the last two months that has been away on holiday so it has been a little difficult. So as we come to the end of August I thought instead of just a monthly favourites I would do a round up of all the beauty products that I have been loving this Summer. 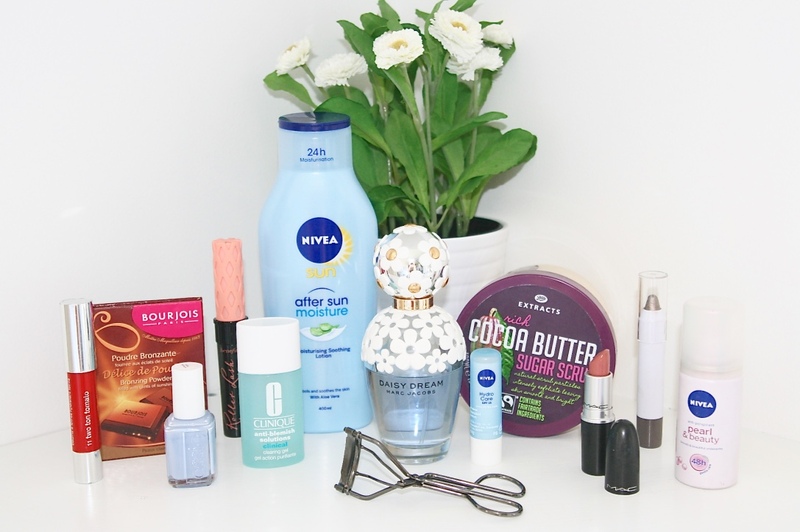 Firstly a few skincare bits to tell you about. I am going to start with the Clinique Anti-blemish Solution as I know I have talked about this a few times before. But these last few months it has honestly saved my skin. It is a bit gross but there have been several times were I have started to feel a painful under the skin spot coming through. But I just use a tiny amount of this on it a few times a day and two days later the would have been horrible spot has literally vanished! Seriously don't know what I would do without this stuff. The next skin care products that I have been loving is Nivea After Sun moisturiser. I've been on a couple of holidays this summer and spent quite a bit of time in the sun. I always wear suncream but after a day in the sun the moisture that your skin has lost needs replacing. I love using this after a cold shower at the end of the day as it smells and feels so refreshing. It also helps to keep a tan looking lovely. I picked up this Cocoa Butter Sugar Scrub at the beginning of summer and I just can't get enough of it. It smells delicious, it really exfoliates my skin and leaves it feeling super soft. But what I really love about this is unlike a lot of scrubs once you rinse it off in the shower it doesn't leave your skin feeling stripped and dry. I don't really know how else to describe it other than like a residue of moisture! It is like the the sugar in the scrub melts away to leave behind a layer of moisture. So if I sometimes feel like I can skip moisturising after using this. I have a lot (under exaggeration!) 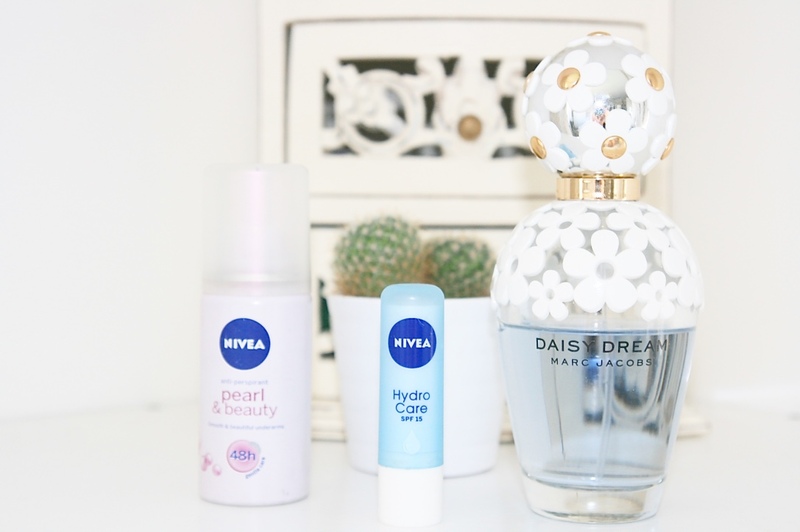 of lip balms, but Nivea Hydra Care is definitely one of my favourite. it's cheap, quick, easy and you don't have to stick your finger in it so it is perfect for on the go. But it also has SPF in which is why I haven't really used any of my other lip balms this Summer. 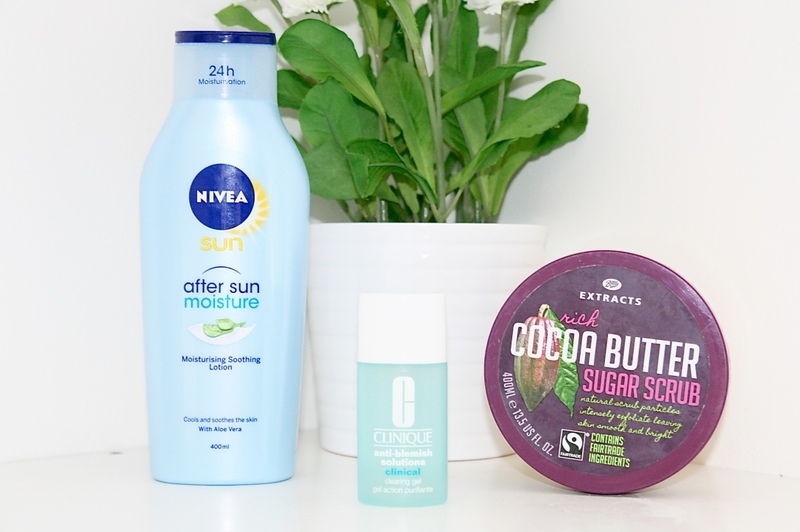 it is really important that when you are out in the sun all day to protect your lips as well as your skin. But I hate a lot of sun protection lip balms. They are hard to apply, drying and basically turn your lips this horrible white colour which is not attractive! So this one is a great replacement that just really hydrated the lips. Marc Jacobs Daisy Dream is just my favourite Summer scent. I picked it up at Duty Free a year ago so it really does remind me of Summer. It's just a fresh, sweet and light scent and the bottle is just absolutely gorgeous! When I am sunbathing or most of the time when I am on holiday I don't like to wear makeup. I am gonna be reapplying suncream, probably sweating a little and just want to be able to jump into the pool or dive into the sea without worrying if my makeup will run! however to keep me from looking totally horrific there are a few things I do. You may recognise his mascara from my what I got for my birthday post last week and be wondering how it is in my Summer favourites. But I have actually been using this mascara all Summer, just in the sample size! I just love this mascara! Which isn't something that I have been able to say for a while. I will probably do a whole blogpost on this with some pictures showing you what it looks like on. But basically all you need to know if that it is slightly more than I would usually pay for a mascara but if you can try it I really recommend it, it's a lovely one! This elf jumbo eyeshadow stick is something that I found in TK MAXX, didn't think I could live without it and then didn't really get into it until several months later! Beauty blogger problems! It is this shimmery bronzer eyeshadow stick that goes on really smoothly and is really blendable. 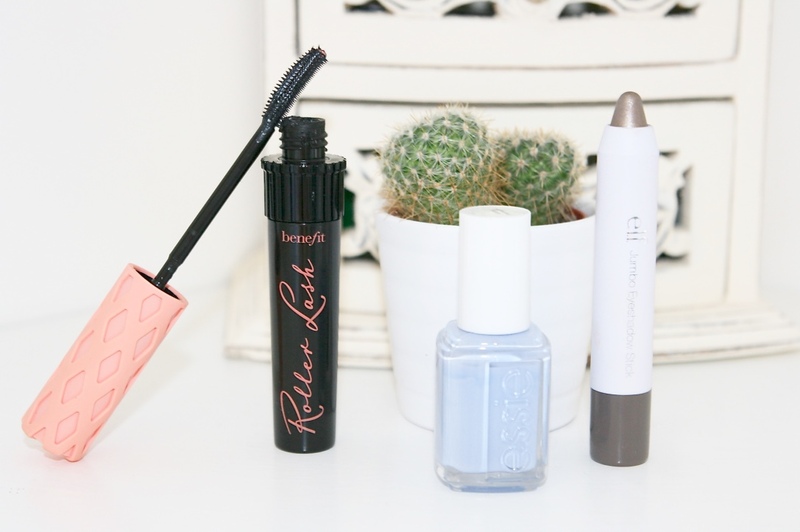 How I like to use is to draw quite a thick messy line on my top lashes, concentrating at the outer corner and then bringing it down along my bottom lashes. And then I just get a brush and really blend it all out. It can be quite subtle and natural but it is really pretty and very quick.